Manufacturer of a wide range of products which include epdm sponge material. We offer EFDM sponge, which are used for gasketing, sealing applications and electrical engineering. These sponge are high performance sponge rubber materials for demanding environmental conditions. Further, our range is resistant to low temperature, exceptional UV and ozone make them suitable for exterior applications in construction and automotive usage. Further, our range also offer good dimensional stability, cushioning properties and vibration dampening properties. 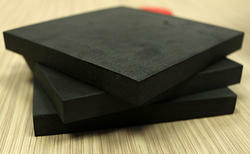 Looking for EPDM Sponge Material ?